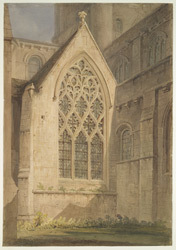 This watercolour shows the detail of a window in the southern transept of the cathedral at Christ Church college, Oxford. This college, founded in 1525 by Cardinal Wolsey, boasts the largest quadrangle of all the university buildings in the city. The site of Christ Church cathedral was originally an Anglo-Saxon nunnery, burnt down by the Danes in 1002. The present building is largely 13th Century gothic, although there are later additions, including a Victorian vestry.